A friend of mine, the talented artist Kelli Davis, created this painting for me. It's inspired by the novel I am working on, and I think it's fantastic. 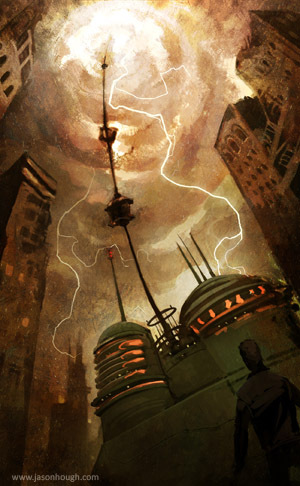 The image depicts my main character looking up in wonder at a space elevator. I think it does a great job of capturing the mood of the book -- the mixture of a post-apocalyptic world existing in the shadow of awe-inspiring technology. I'm thrilled, honored, and humbled to say that I've been signed by Sara Megibow at the Nelson Literary Agency. Sara was my absolute first choice, and I couldn't be happier that we're now working together. I may be the only signed writer in modern history to say it, but I only ever sent one query letter. I have to--have to--pat myself on the back for that accomplishment. I'm happy to see that Scrivener is finally making its way to Windows. Previously Mac-only, this wonderful writing tool is the main reason I own and use a Mac. It will be nice to have options in the future. And, even better, my Windows-using friends will now be able to benefit from Scrivener's capabilities. You can read more about it here, or watch the video. This summer the wonderful Clarion Foundation school at UCSD is hosting a write-a-thon. This is a great way for writers to support the school and participate as well. If you're unfamiliar with the Clarion Foundation, it's a summer learning program at UCSD, where they've been teaching Science Fiction and Fantasy writing to promising writers since 1968. They bring in an amazing group of instructors every summer (the lucky lil bastards get to learn from George R.R. Martin this summer). I've signed up. You should, too! Last weekend I participated in the San Diego Writers, Ink "Blazing Laptops" write-a-thon, which raised over $16,000 for the non-profit. I took only my iPad and portable keyboard to the 9-hour event. By the end, after using the device the whole time, I still had 75% of my battery left. Color me impressed. Granted, I turned wifi off, but still... it felt great to be untethered from the wall outlet. Well, well... Apple certainly has released a polarizing device. And while I can't argue with those who question the average consumer's need for an iPad ("it's just a big iPod Touch"), I find it very compelling as an average creator. From a pure writing standpoint, it meets most of my needs as a portable tool (when combined with the keyboard dock). The battery life is excellent -- I estimate I can get 20 hours. It has no noisy fans, it's light, it's "always on" (no boot up time), and the screen is in a portrait orientation (again, when combined with the keyboard dock) . I find that more conducive to writing, especially in lower resolution displays. Netbooks are all wide-screen, useful for watching video but not so useful for the vertical display of text. There's other benefits as well. It's a great reading device. 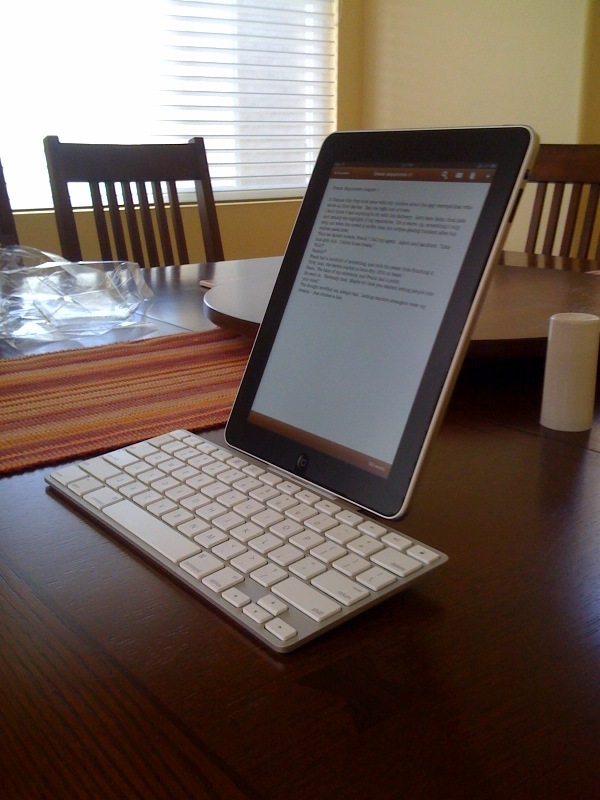 Perhaps even better than the Kindle, since the screen is lit. The Kindle's main flaw, to me, is that it's a single-tasker, which makes it hard to justify the expense. For roughly two times the price, an iPad can do the same stuff (there's even a Kindle app for it), plus so much more. Now, don't get me wrong. I'm still a big fan of physical books. But a lot of writer's don't realize one of the great features of the Kindle book store (and, now, Apple's iBooks): you can get a free sample of any book in there. Usually about 50 pages. Anytime I hear someone say "oh, you should read so-and-so, she's great", I don't have to jot that down and, sometime later, pick up one of their books at the bookstore and read a bit of it. I can download 50 pages right there on the spot. Enjoy it, study it, and annotate it. Download enough samples and you've created for yourself a compendium of writing examples from published authors, all available to you at any time. The iPad is also a sketchbook. There's a bunch of drawing applications available. You can do mind maps, take notes, create outlines, do research (via the web). There's even a free version of Dragon Dictation, allowing you to voice your ideas (or dialog!) and have it captured as text. I could go on. I guess if I had one wish, it would be for an iPad version of Scrivener. That qualm aside, it's the best portable writing device I've used. It will definitely replace my netbook, Alphasmart, and Kindle. I'm starting to think there is validity to the concept of wholesale rewriting. My feeling up until recently was that anything could be salvaged with enough finessing. But today I reached a chapter that I knew needed massive changes. I knew the ending it needed to come to, so I deleted almost the entire thing and re-wrote it from scratch. It felt liberating -- challenging even -- to start with a fresh page and come up with something better. In a way it feels like the first draft was really just a way to figure out how the thing should end. Once you know your ending, you can go back and figure out a more dramatic way to get there. It's coming! World Fantasy Convention 2010. I've got 247 days left to get my novel into shape. I've been lax in updating my blog here with the progress. Between the novel and a newborn baby at home, my free time is shot. So I'm going to start posting more often, but just small status updates or tasty wisdom-nuggets. Currently Mike has provided high-level feedback on the plot, characters, and setting. Chapter by chapter. Wonderful insight, I couldn't be happier. I've returned to him edits to part 1, and I've started working on the rest. Meanwhile, Mike has started detailed proofreading of part 1. Tools-wise, the only change has been moving from my beloved Scrivener to MS-Word. Word has better change-tracking features, and it's a file format Mike and I can exchange easily.